Vermont senator and self-described socialist Bernie Sanders campaigned in Tampa Bay and Orlando on Friday for Tallahassee mayor Andrew Gillum, who is hoping for an upset against the party establishment to become the Democrats' gubernatorial nominee. 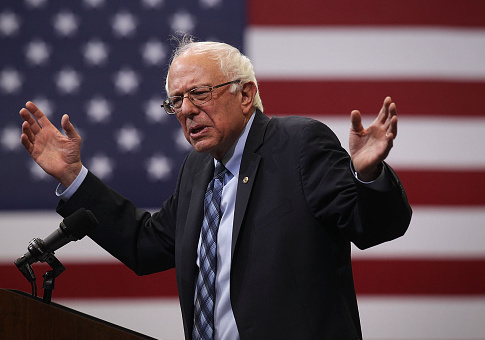 "Right here in Florida, you have the opportunity to not only transform this state politically by electing a strong progressive but you have an opportunity to send a message that will be heard all over the country," Sanders told a crowd of about 1,000 supporters. Gillum's campaign has thus far largely been sustained by six-figure donations from George Soros and Tom Steyer, two of the largest donors nationwide to Democrat and progressive causes. Gillum was the toast of a Hollywood fundraiser in March promoted by Alyssa Milano and Alec Baldwin. Then, in early July, California billionaire and political activist Tom Steyer gave a full-throated endorsement to Gillum and said he'd be making a $500,000 grant to Forward Florida, coupled with a similar amount of in-kind help with get-out-the-vote efforts. Gillum's supporters on Monday were cheered by a new poll showing him running in third with 21 percent behind former congresswoman Gwen Graham at 27 percent, and former Miami Beach mayor Philip Levine at 25 percent. Although still in third place, the poll is a noticeable improvement from earlier in the summer, when Gillum seldom broke out of the low-to-mid teens. "He's hung in there through a lot of adversity, when he could have quit he didn't," Mac Stipanovich, a long-time Florida political consultant told the Washington Free Beacon. "He's inspirational for many people, he's a good speaker. He's always very popular at the big crowd events, and the candidate forums and such things, but I just don't know if he's packing enough to get there from here." Gillum supports a single-payer health care model and has been a vocal critic of the National Rifle Association in a year in which gun control will continue to be a major issue in Florida in the wake of the Parkland High School shooting earlier this year. However, Sanders-backed candidates have a mixed record this primary season. Abdul El-Sayed, who ran for the Democratic nomination in the Michigan gubernatorial race on a progressive platform and was endorsed not only by Sanders, but also by Alexandria Ocasio-Cortez, lost. Steve Mitchell, a political analyst in Michigan, said the progressive vote in Michigan was split, costing El-Sayed votes. However, Stipanovich believes the exact opposite is the most likely scenario under which Gillum could become the nominee. "The theory I suppose behind the Gillum candidacy is that since we no longer have run-offs in Florida, that all you've got to do is have one more vote than the second-place person," Stipanovich said. "And so if everyone else is dividing up the primary voters to your right, and you can hold the left, then you get elected with 27 percent of the vote, or win the nomination with 27 percent of the vote in a large, multi-candidate field." "I doubt that's going to happen," he added. Republican support appears to have consolidated around Congressman Ron DeSantis for their party's nomination. Early voting has begun in the Sunshine State, and ends on Aug. 28. The Gillum campaign did not return a request for comment. This entry was posted in Politics and tagged 2018 Election, Bernie Sanders, Florida, George Soros, Tom Steyer. Bookmark the permalink.